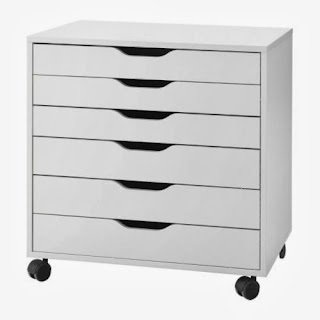 Craft Storage Most Popular | Alex - from IKEA - the most used craft storage unit? When I recently had a look through my Pinterest Crafty Storage board to see what kept reappearing. There is of course the tall thin version as well. Anna's is one of my favourite as she has creatively remove the top two drawers to create an extra open tall drawer at the top. 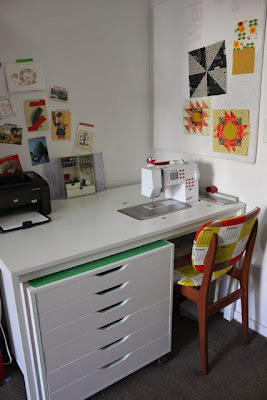 Amy makes it a lovely sewing area desk unit. 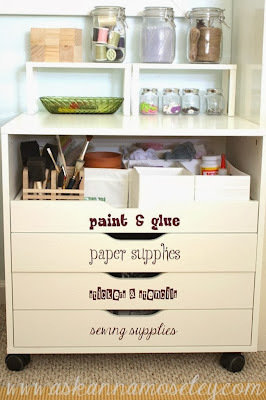 I like how inside all these drawers there are extra organisers for smaller items, idea from Caprice. Anita's used three of them to create a working island. Perfect for those die cutting machine as well as trimmer area. Ikea Hackers has also a step by step tutorial on how to decoupage with old maps one of these popular units. There is even a Flickr gallery (highly recommended) and a Hero Arts Flickr discuss groups on the Height and depth of them, Alex wide here and the tall and thin here. Or a Splitcoasters Thread on them which again I highly recommend to visit as it discusses the height of the drawers. Well, I have got one of those units and I have to say it lives up to the hype!